Billy Casper Golf (BCG) Chairman and CEO Peter Hill has been ranked No. 6 on Golf Inc. magazine’s recently-released “Most Powerful People in Golf” list, the 10th consecutive year he’s finished in the top 10. Hill joins PGA Tour Commissioner Tim Finchem, business mogul Donald Trump and United States Golf Association Executive Director Mike Davis among golf’s foremost influencers. 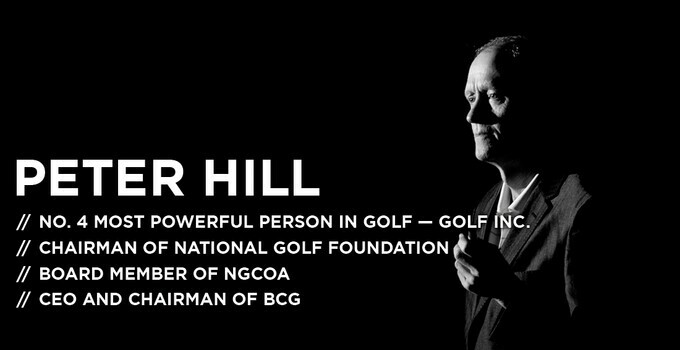 Co-founding BCG in 1989 with business partner Robert Morris and PGA Tour legend Billy Casper, Hill has passionately directed the company to become the highly respected owner-operator of a portfolio of golf courses, country clubs and resorts that’s the largest domestically and fourth largest worldwide. Merger with Kitson and Partners Clubs under the BCG name, accounting for 13 new properties. Addition of Joe Steranka, CEO of the PGA of America from 2005 to 2012, as Chief Global Strategist for BCG and Buffalo Communications, the in-house marketing and PR division that represents top golf, sport and lifestyle brands. Launch of the Billy Casper Digital Network, comprised of 120-plus websites and more than 500,000 unique visitors monthly, that delivers new, compelling and highly-curated content across traditional and mobile devices for greater brand engagement and sales. Advent of the BCG Superintendent Business Institute to enhance the business skills of superintendents and assistant superintendents with eligibility for Golf Course Superintendents Association of America credits. Expansion of the BCG University career development platform with 16 new training modules – including “The Fundamentals of Effective Thinking,” “Interpersonal Communications” and “Financial Statements” – for the company’s 6,000-plus employees (peak season) and good toward PGA of America education credits. Early adoption of FootGolf, a widely popular hybrid game of golf and soccer, to attract new guests and provide overall excitement. Record fundraising of more than $887,000 for Wounded Warrior Project from the “2014 World’s Largest Golf Outing” on August 11th that involved more than 12,000 golfers, including 363 injured service men and women, at 110-plus BCG managed courses.